Tubulogenesis, or the formation of tubes, is one of the fundamental morphogenetic events taking place during development. Several major organs, such as the respiratory, circulatory, and secretory systems, are constituted by an interconnected network of tubes. Within the body, tubes are essential for several functions, including delivery of gases, nutrients, and hormones, removal of waste products, compartmentalization of organ functions, and in forming physiological barriers between an organ and its environment. Tubulogenesis involves the assembly of a polarized sheet of cells around a central lumen, such that the apical surfaces of cells line the lumen and are in contact with the transport medium, whereas the basal surfaces face away. Although epithelial tubes all follow the same basic structure, almost every tubular organ develops in a distinct manner. This leads to tremendous diversity in tube morphology- in terms of size, shape, and the number of cells within the cross-section. However, despite considerable variations in the molecular and cellular sub-processes involved, some conserved underlying mechanisms in tubulogenesis have been identified. 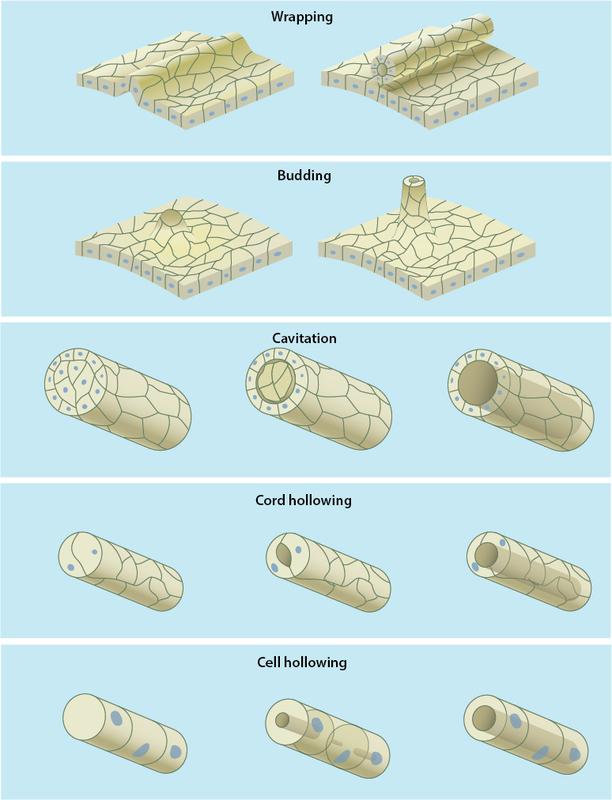 Depending on whether the tubular organs are formed from already polarized cells or they require de novo polarization of cells, cellular organization during tubulogenesis can be categorized into one of these five general mechanisms: wrapping, budding, cavitation, cord hollowing, and cell hollowing . 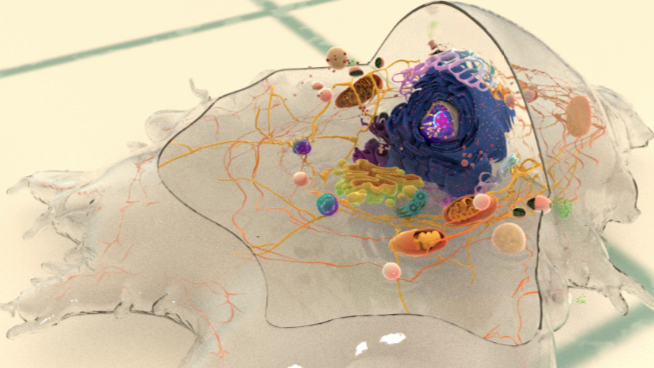 The formation of tubular organs from already polarized cells commonly occurs by two closely related processes: wrapping and budding. Wrapping is initiated by the invagination of a portion of the cell sheet to form a trough or cup-like structure, following which the edges fold until they meet and fuse with each other. The fully formed tube completely separates from the epithelial cell sheet and runs parallel to the plane of the epithelium. Budding, on the other hand, involves the formation of buds or protrusions that extend orthogonally from the plane of the cell sheet and remain contiguous with the parent epithelial tissue. A number of morphogenetic events across different phyla are driven by these two cellular mechanisms, including neural tube formation in amphibians and the formation of anterior neural tube in mammals and birds by wrapping as well as the development of Drosophila salivary gland and trachea using budding  . Unlike wrapping and budding, tubular structures formed by cavitation, cord hollowing, and cell hollowing are derived from unpolarized precursor cells. During cavitation, as the cells along the periphery of the epithelial primordium polarize, the cellular mass in the central region undergoes apoptosis in order to form a lumen. This mechanism of tube formation is seen during the development of mammalian mammary and salivary glands as well as in the formation of the caudal portion of the amniote neural tube . MDCK cell models cultured on a less differentiated matrix that delays cell polarization also adopt cavitation to clear away an excess of unpolarized cells, which get accumulated in the luminal space . The other two closely-related mechanisms of cord hollowing and cell hollowing involve either the formation of multiple luminal spaces at apical junctions between cells that fuse to form a large, continuous lumen, or the formation of multiple intracellular vesicles called vacuolar apical compartments that merge with each other before they fuse with the cell membrane and form a continuous lumen with similarly formed lumen in adjacent cells, respectively. While cord hollowing has been observed during the formation of zebrafish gut, and during the secondary neurulation in chick and mouse embryos , cell hollowing has been described during the development of excretory canal in C. elegans, blood vessels in zebrafish and tracheoles in Drosophila .